Jon Jones Outpoints Anthony Smith, Wins The Fight Via Unanimous Decision, Remains the Champ! The Light Heavyweight title fight between the current UFC 205-pound champion Jon Jones and the former CCFC and VFC Middleweight champion Anthony Smith is headlining the UFC 235 PPV (pay-per-view) event, which is set to go down tonight (Saturday, March 2, 2019) from inside T-Mobile Arena in Las Vegas, Nevada. The referee in charge for this contest is Herb Dean. It’s time!!! The match starts! Fighters touch gloves. Jones misses with a right front kick. “Bones” switches stance. Low kick Smith, he switched stance too. Smith looks cautious. Low kick Smith again. Jones misses, overhand just missed. Jon Jones lands a left spinning back kick to the body and a low kick. Smith misses with an overhand right. Jones goes for the axe kick, just missed. Excellent low kick for Anthony Smith. Low kick Anthony. Jones misses with a hook. Jon Jones lands a spinning back kick to the body and goes for a low kick. Jones feints. Smith landed a high kick, Jones survives and clinches up with Smith. Smith is against the cage, shoulder strike Jones. Wow, good elbow by Smith, wait ago! Short knee from Anthony Smith, Jones lands shoulder strikes, but Smith separates. Sidekick to the knee Jones. Left hook by Jon Jones missed by a hair. Left side kick to the body Jones. Wow, Smith delivers a good right hand, Jones returns with a kick. Smith is waiting too much, Jones lands to the body again. Low kick Jones. 10-9 Jones. Smith’s coaches demand more different strikes. Jones misses with a jab. Low kick Jones. Jones misses with a left high kick. Wow, good right-hand counter Smith. Jones lands a kick. Low kick Jones again, followed by a body kick. Sidekick to the knee Jones. Spinning back elbow Jones, fighters are in the clinch again. “Bones” delivers shoulder strikes. Knees to the mid-section Jones. Smith waits too much. Good right hand by Smith, who misses with a big overhand too. Smith checks a low kick. Left front kick Jones. Right front kick Smith. Low kick Smith, and a punch to the body. Jones hits a front kick to the face, Smith defends well. Left low kick by Jones. And again. Smith goes for a left hook and lands a good right hand. Jones delivers few kicks to the body. Left low kick Jones. Smith is one the cage, Jones goes to the body, but Smith defends well. Sidekick to the knee Jones. And another low kick by Jones, fighters in the clinch again. 10-9 Smith. Smith’s coaches order him to fight as he “has seen everything his rival knows”. Good right hand by Jones. Smith holds guard well and misses with a right hook. Good front kick by Jones. Jon Jones shoots in and lands a knee. Smith is on the fence again. Knees to the thigh. The crowd starts to boo. I think the referee could separate them now, no action. Common Herb, what’s wrong with you tonight? Jones controls the cage well. Smith is defending, but he is losing the match. Jon Jones lands knees to the thigh again. And a punch to the body. Shoulder strike Jones. Jon Jones takes his rival down! Smith turtles now, he is in the north-south position at the moment, he controls one hand, ended up in the front turtle. For now, it seems ok for Anthony Smith. Smith controls rival’s left hand well, but Jones pushes rival’s head towards the fence. Jones delivers knees to the shoulder, Smith is tucked against the fence. Jones punches him on the ground. Smith stood up and grabbed Jones’ left leg. The end of the round, 10-9. Smith’s coach tells him that he has to go offensive! Fighters are looking at each other, Jones tries jumping side kick to the knee but misses. Left high kick Jones, followed by a left spinning back kick. Elbows by Jones, Smith does nothing. Punches to the body Jones. Flying knee by Jones, followed by an elbow, and now Smith is on the cage. Hey, this was a soccer kick, what is wrong with Herb Dean? Jones controls him on the ground, Smith turtles. 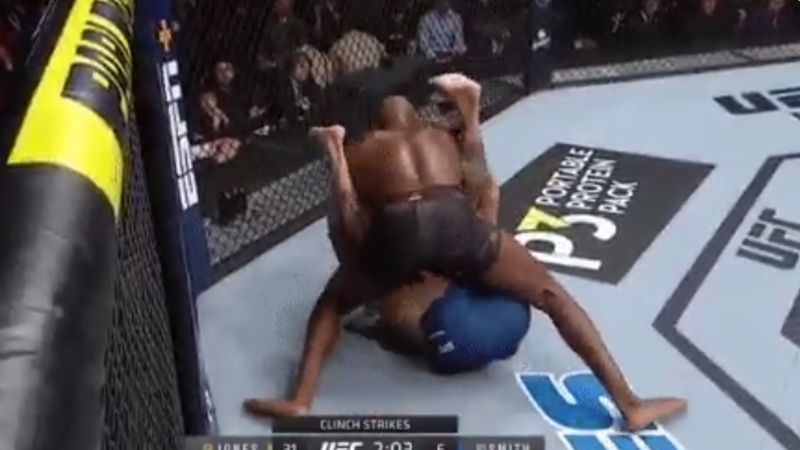 Jon Jones controls his back, delivers punches to the head. Few more punches to the head by Jones, Smith is bleeding. Jones controls the back again. Smith gets up, but Jones wrapped his hands around Smith’s waist. Jones now lands a knee to the body, Smith turtles and defends. This is a bit disappointing performance by Smith, it seems Jones continues raining punches. Terrible round for Smith. What a knee to the body, this had to hurt. And again. Now Smith sits against the fence. Elbow to the head Jones. Jones controls his rivals, dominates. Hey, this was an illegal knee. Now Herb Dean is nervous! Herb Dean is looking at the replay. Wow, this knee was illegal 100%! Let’s see what happens now! Herb Dean abducts two points from Jon Jones!!! Herb asks what happened on the replay, asks other judges, yes, the decision stands! It could be 9-8 for Smith, this round. Smith’s coaches criticize him badly!!! Smith continues, what a warrior. Herb Dean warns Jon Jones for the last time!!! Jones moves around. Great right hand by Smith. It seems Jones goes with an uppercut to the head. Smith counters, he has to risk now. Smith defends the takedown like a pro, great sprawl. Good side kick to the leg Jones. Smith checks the low kick. Smith is obviously fatigued. Smith is pressed against the cage. Jones controls the cage again, “Lionheart” does nothing again. Knees to the leg Jones. Shoulder strikes Jones. Hey, it was knee to the nuts! Herb Dean is not separating them. Smith defends another takedown, what is this guy made of? Jones controls the cage, Herb Dean doesn’t even think of separating fighters. Smith is pressed against the cage, he does nothing. Jones too. Knee to the thigh Jones, who continues keeping his rival against the fence. Smith still defends takedowns well. Fighters separate, flying knee Jon Jones, and the match is over. Bad round, I’d say 10-9 Jones. Anthony Smith drops to 31-14 MMA, 7-3 UFC, Jon Jones improves his score to 24-1, 1 NC MMA, 18-1, 1 NC UFC.